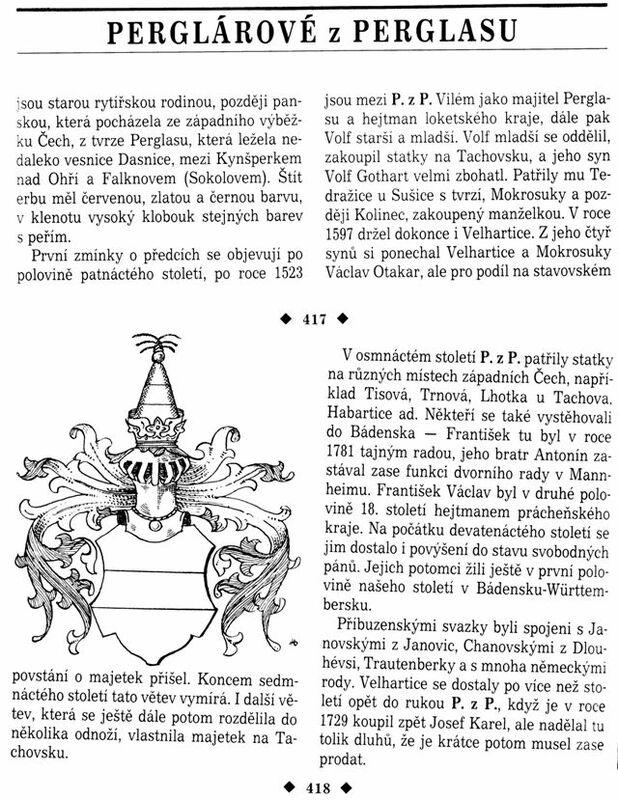 Lexikon Ceske Slechty - Erby, Fakta, Osobnosti, Sidla a Zajimavosti by Jan Halada, pg 417-418. Perglarove z Parglasu are an old knight family. They came from the west part of bohemia from the fortress Perglas by the village of Dasnice, between Kynsperk nad Ohri and Falknov (Sokolov). The first mention of them is found in the middle of the 15th century. In the year 1523 Vilem Perglarov z Parglas was the owner of the Perglas estate. Subsequently, Volf the Elder and Volf the Younger owned the estate. Volf the Younger separated himself and purchased houses and lands in Tachovsku. Volf the Younger and his son Volf Gothart became very wealthy. He (Volf Gothart) owned Tedrazice village by Susice fortress, Mokrosuky and old Kolinec, purchased by his wife. In 1597 he even owned Velhartice. He (Volf Gothart) had four sons, one of them, Vaclav Otakar, kept Velhartice and Mokrosuky. However, on account of his participation in an uprising, he lost his property. At the end of the 17th century this line was dying, and would have died except another line subsequently slipt off and owned property in Tachovsk region. In the 18th century the Perglarove v Perglasu family owned properties in many areas of West Bohemia, including Tisov, Trnov, Lhotk and Tachov. Some of them moved themselves to Baden - Frantisek was in 1781 a secret counselor, his brother Antonin worked as an official city counselor in Mannheim. Frantisek Vaclav, in the 2nd half of the 18th century, was a city leader in the Prachenskoy District. In the first half of the 19th Century they lived in Baden-Wurttemburg. They were closely associated with the Janovskymi z Janovic, Chanovskymi z Dlouhevsi, Trautenberky and many other German families. In 1729 Josef Karel bought back the land of Velhartice, but due to large debts had to sell the land.